“I signed up to be a ‘ground pounder’ in the Big Red One,” he said with a smile 45 years later. I was born in Lynn, Mass. and went to war when I was 18-years-old. “I got off the plane into a totally different culture. I had never been out of the states in my life. Certainly no place like Vietnam,” he said. “We ended up in a place called Suoi Bong, 19 miles northwest of Bien Hoa Airbase. “There was a lot of stuff happening when we arrived. During the day we did search and destroy missions. At night we’d go out and set up a listening post and an ambush for the NVA (North Vietnamese Army) or the VC (Vietcong). “During the morning of Feb. 23, 1966 we were told we were going to fly out in helicopters to be reinforcements for some airborne units. We flew out there early in the day and dug our fighting holes for night. Nothing was going on, it was a normal day,” the 66-year-old retiree recalled. “Just before dusk they came along and selected a squad to go out in front of our company and act as a listening post. That squad happened to be us,” he said. “We ended up in the bushes about 15 feet off this little dirt road. “We had no machine-guns, but we had Claymore mines. This was the opening salvo in what would become known as the Battle of Suoi Bong Trang. The Vietcong 9th Division together with segments of the 761st and 763rd Regiments of the NVA attacked the “Black Lions.” The enemy committed more than 2,000 soldiers to the fight. “We got permission to move our location because it had been compromised. We moved back toward our main unit and set up along the edge of the dirt road again,” Heurlin said. “About 3 a.m. we started hearing enemy mortars coming our way. They had our location pegged and the mortars were raining down right on top of us. “Right after that we heard bugles blowing. The NVA came after us on three sides and there were only seven of us in the listening post. Within a few minutes five out of the seven of us were killed. The guy in front of me was hit in the face with something and I was hit three times by enemy fire: once in the neck, my left shoulder and they put one right through my chest,” he said. “I ended up on my back on the ground. Then the NVA shifted their fire to our main base which was maybe 100 meters beyond us. We were caught in a firefight between our base and the NVA. “Later on they sent a tank out to try and pick us up. Enemy fire was so intense against the tank it had to back off and leave us there,” Heurlin recalled. “I laid out there on the ground so close to enemy machine-gunners I could hear them talking, I laid there from 3 a.m., when I was wounded, until 7 a.m., when I was rescued. “I took my M-16 rifle and put it on full automatic and laid it beside me. That’s all I could do. If they had known we were there they could have walked over and finished us off,” he explained. “When it became light, about 7 a.m., we brought in air power and the NVA and VC scattered. Our company came out of its base camp and ran off what was left of the enemy. “They found the two of us alive. I was Medecvaced to a hospital in Saigon. From there it was on to the Philippines for me and another hospital. After that I was taken to Chelsea Naval Hospital in Chelsea, Mass., outside Boston. I spent my last few months of my seven months recuperating at Valley Forge Army Hospital in Valley Forge, Pa.,” he said. 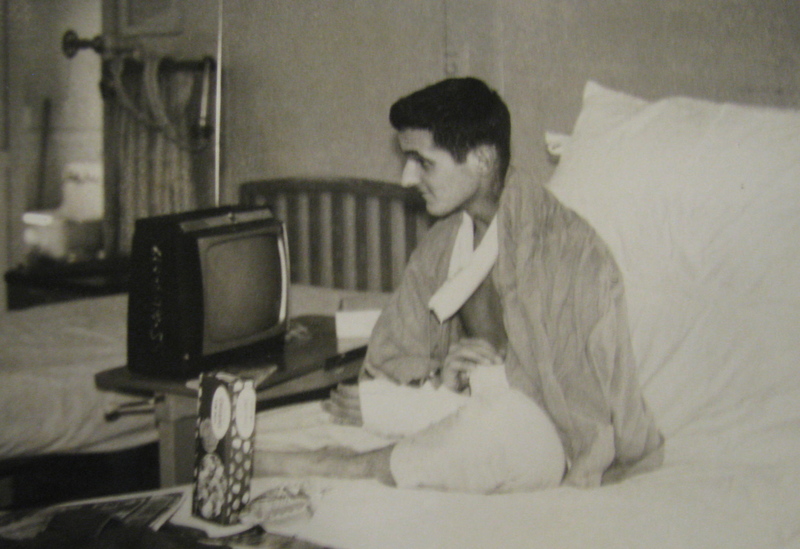 Heurlin only lasted seven weeks in Vietnam before being wounded. “We had some guys who shipped out with us that didn’t make it a week. I can remember we ran across this little bridge the first week we were in Vietnam. I went left around the bridge and the other guy took the right side. He stepped on an enemy mine and that was the end of him. It was the luck of the draw,” he said. When Heurlin was discharged from the service in 1970 he eventually went into the home construction business. He obtained his contractors license and started building houses on Cape Cod. 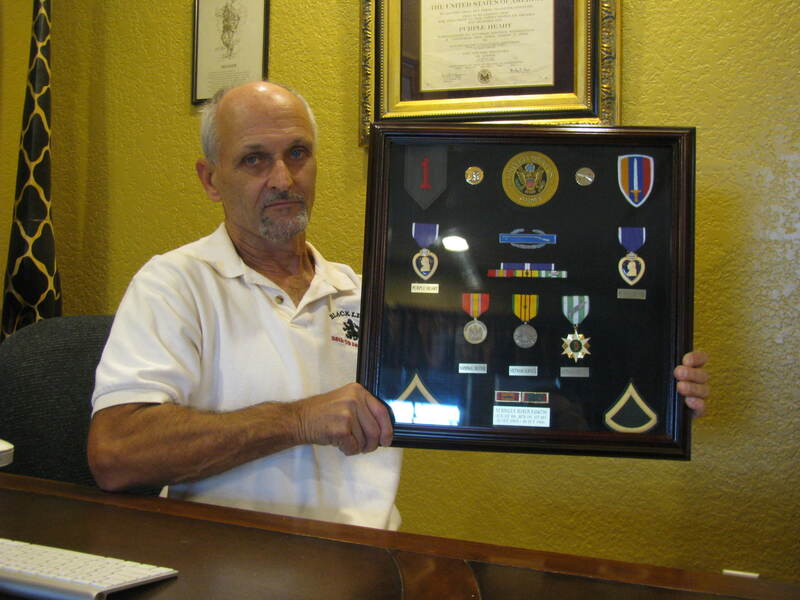 Thirty years later he sold his business and he and his wife, Kimberley, retired to Punta Gorda in 2004. He has two grown sons from an earlier marriage, Eric and Richard, who both live in Florida. “What was your feeling about returning from Vietnam and discovering many civilians in the U.S. didn’t support the war? This story was first published in the Charlotte Sun newspaper, Port Charlotte, Fla. on Monday, Jan. 6, 2014 and is republished with permission. That war hits so close to home. Thank you for your service and sacrifices!